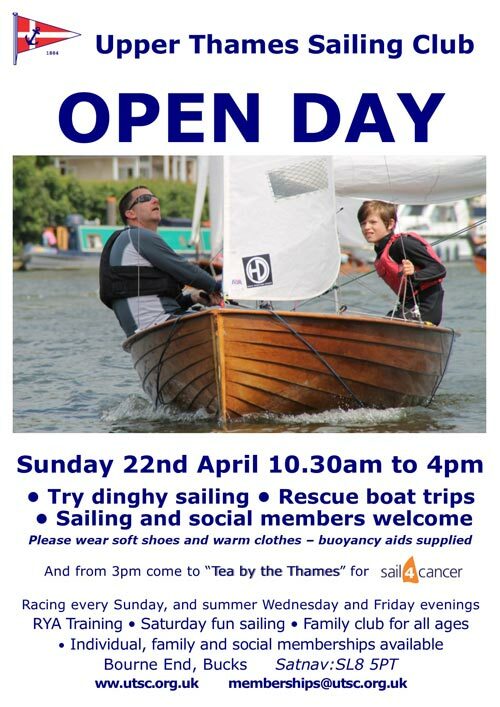 Come and find out about sailing on the Thames at Bourne End, on the widest reach of the upper Thames. Dinghy racing, training for children and adults, and regular social events. On Open Day there'll be a chance to meet everyone, see our fantastic location and clubhouse, and go for a sail, including Rater rides. Plus "Tea by the Thames" from 3pm. Membership is open to all, families welcome, and non-sailing partners are included in membership. See the Upper Thames Sailing Club (external website) for more information. Access from Coldmoorholme Lane, or on riverside footpath from Bourne End village.